When your plant and tool hire company is hitting a busy few months, there are a few options available. You can put your head down and work some long gruelling hours, rely on a local freelancer or reach out to eager and focused apprentices who are looking to make their way in the trade. The latter option is perhaps the most favourable, mainly due to the host of benefits it can bring to a company. Many plant and tool hire companies are using apprentices to add skills to their workforce and lend a willing extra pair of hands. 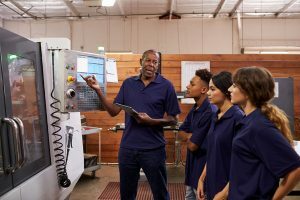 There is no upper age limit for becoming an apprentice but the majority of apprentices now fall into the Generation Z demographic. That’s not a fact that should put recruiters off apprenticeships. Generation Z is a demographic that is the workforce of the future with qualities that are slowly making their way into the working world. The title of Generation Z is assigned to anyone born in 1997 and onward, according to a recent report by Pew Research Centre. The demographic is now reaching the age where they are beginning to filter into workplaces across the country, bringing a fresh new way of thinking. Having been born in an era of extreme digital growth, Generation Z is the first demographic to have been fully absorbed within the connected, computerised world. The internet, social media, artificial intelligence, virtual reality have been accessible to the generation since they could walk, dubbing them the most tech-savvy generation yet. With technology being a large part of their early years, Generation Z can easily be introduced to new technology, programs and systems – making training a breeze! For industries such as plant and tool hire where roles are heavily technologically focused, this generation is able to interrogate easily. Aside from taking to new technology like a duck to water, Generation Z are trained multitaskers, absorb information fast and are full of ideas. For the apprentice themselves, taking part in an apprenticeship is very worthwhile. A Federation of Master Builders report in 2016 found that 98% of SME owners in the construction sector value apprenticeships over degrees when recruiting new staff. Looking to launch or progress your career in the plant and tool hire industry? Get in touch with our expert advisors at Embark Recruitment to find out how we can get you placed in your dream job. Take a look at our current jobs or call us on 01530 588841 to discuss the kind of roles you are interested in.